Kenneth Burke, arguably the most important American literary theorist of the twentieth century, helped define the theoretical terrain for contemporary literary and cultural studies. His perspectives were literary and linguistic, but his influences ranged across history, philosophy, and the social sciences. 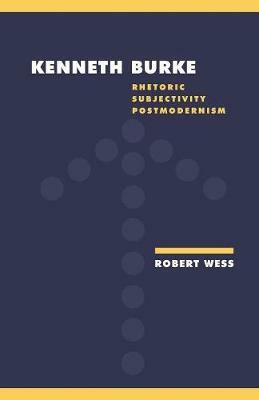 In this important study, first published in 1996, Robert Wess traces the trajectory of Burke's long career and situates his work in relation to postmodernity. His study is both an examination of contemporary theories of rhetoric, ideology, and the subject, and an explanation of why Burke failed to complete his Motives trilogy. Burke's own critique of the 'isolated unique individual' led him to question the possibility of unique individuation, a strategy which anticipated important elements of postmodern concepts of subjectivity. Robert Wess' study is a judicious exposition of Burke's massive oeuvre, and a crucial intervention in debates on rhetoric and human agency.